Enjoy the Nation's Capitol at night! 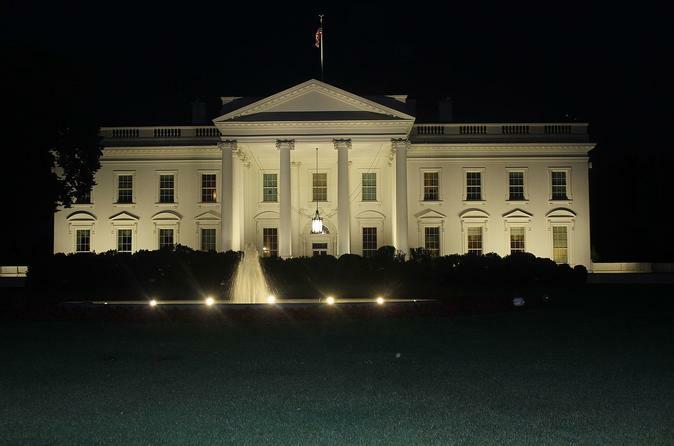 Your personal Tour Professional will pick you up from your hotel, then you'll be headed to see how Washington DC lights up when the sun goes down. Enjoy the beautiful Potomac River. See the enchanting Thomas Jefferson Memorial reflected in the Tidal Basin. See the Washington Monument's breath taking reflection in the reflection pool. Enjoy an educational, and entertaining narration while you are escorted in your luxury SUV by your tour professional through the city of Washington DC. Bottled water is provided during this great experience. After the tour a small dinner is provided as well. You'll start your tour by being picked up from your hotel at 7:00. Then you'll enjoy a live commentary from your Tour Professional en route to the Unites States Capitol Building for your first photo opportunity. Then it's off to the White House straight down Pennsylvania Avenue. You will travel the inaugural parade route, the same route every President takes to the White House after being sworn in. Your next site will be the World War II Memorial which will blow your mind with the way it lights up at night. The Thomas Jefferson Memorial is next on your agenda, and is called the crown jewel of the National Mall, and as you will see, for a very good reason. Our newest memorial, Rev. Dr. Martin Luther King Jr. is next, which will absolutely take your breath away. Then you get to go on a night patrol with the soldiers at the Korean War Memorial. Just a short walk away is the Abraham Lincoln Memorial, which sits majestically at the opposite end of the National Mall from the Capitol Building. You can stand where Martin Luther King delivered his infamous "I Have a Dream" speech, then stand where Forrest Gump saw Jenny. After Lincoln, the somberness of the Vietnam War Memorial will touch you to your very core. Your final stop will be to see those six guys pushing up the flag on the mountain, the Iwo Jima (Marine Corps) Memorial. After all the sightseeing is done, the exclamation point will be for you grab a bite to eat.